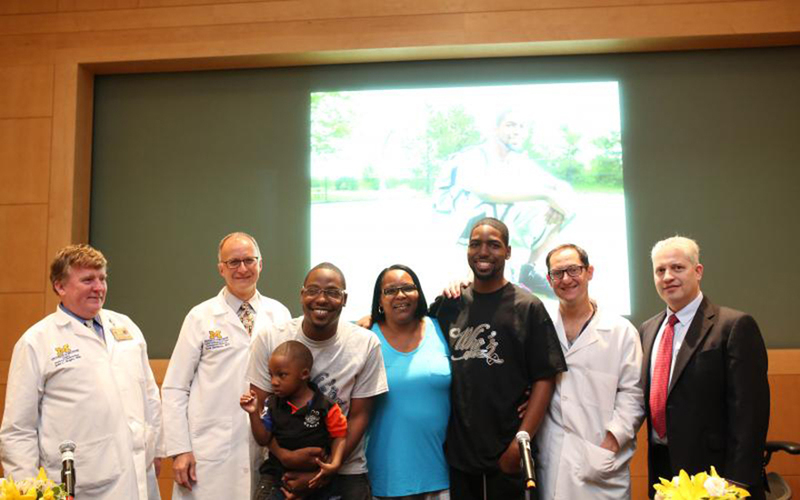 Total artificial heart patient returns to U-M for heart transplant. All transplant patients are exceptional, but Stan Larkin’s successful heart transplant comes after living more than a year without a human heart and relying on a heart device he carried in a backpack. The first patient in Michigan ever discharged with a SynCardia temporary total artificial heart, or TAH, in 2014, Larkin was back at the University of Michigan Samuel and Jean Frankel Cardiovascular Center in May for a heart transplant. The surgery, performed by Jonathan Haft, M.D. (Fellowship 2001, Residencies 2003 and 2005), was a unique national triumph in efforts to replace the failing heart as heart disease grows and donor hearts remain scarce. Stan’s older brother Dominique also relied on a TAH before a heart transplant in 2015. The brothers were diagnosed as teenagers with familial cardiomyopathy, a type of heart failure that can strike seemingly healthy people without warning. It's linked to a leading cause of sudden death among athletes called Arrhythmogenic right ventricular cardiomyopathy (ARVC). “They were both very, very ill when we first met them in our intensive care units," says Haft, associate professor of cardiac surgery. "We wanted to get them heart transplants, but we didn't think we had enough time. There's just something about their unique anatomic situation where other technology wasn't going to work." The temporary total artificial heart is used when both sides of the heart fail and more common heart-supporting devices are not adequate to keep patients alive. Rather than stay in the hospital, Larkin used a wearable, 13.5 pound Freedom® portable driver to keep the artificial heart going. “He really thrived on the device,” Haft said looking at a photo of Stan on a basketball court. “This wasn’t made for pick-up basketball,” he joked. As Haft teaches at the University of Michigan Medical School, the brothers have joined him to discuss the impact of advanced circulatory support for those with end-stage heart failure. Domonique Larkin, left, and his brother Stan Larkin, relied on total artificial hearts before successful heart transplants at the University of Michigan Frankel Cardiovascular Center.